It's no secret that we're huge fans of Guidecraft around here. One quick search of our past reviews and it's clear that we think everything from their educational toys to their doll furniture is top of the line. And let's not even attempt to forget about their play kitchens. I don't think I could be more excited about being able to host a giveaway for Guidecraft's incredible All In One Kitchen - let me tell you, it is going to make the most amazing holiday gift for an extremely lucky child out there. So, when we had the opportunity to try another of Guidecraft's great items from their toys and manipulatives category, I couldn't wait to see what skills it would help encourage. 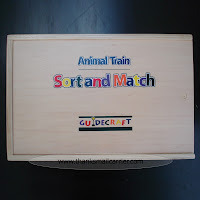 And, when the Animal Train Sort and Match arrived, I immediately knew this would be one that we would continue to use for years to come. This award-winning learning toy is instantly impressive due to its well-constructed wooden storage case and, once easily slid open, the 43 colorful animal and train pieces and six double-sided pattern cards. After a peek inside, are there kids that wouldn't want to reach in and begin play with this innovative toy? 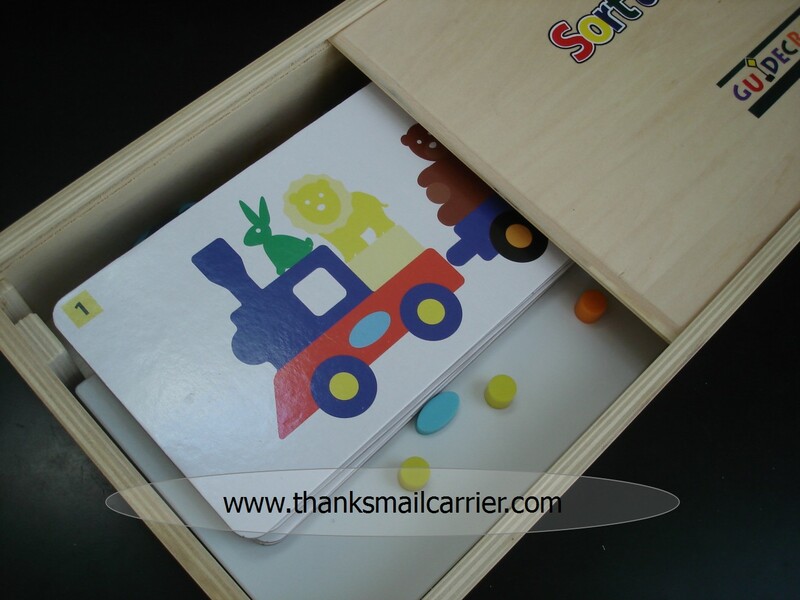 Pulling out the self-propping board with pegs and metal backing, the only setup required for this toy is to slide the board directly into the provided slots and choose which of the cute and cheery cards you would like to create. Turning it over to Big Sister E, she studied the cards for a while, chose her favorite and began sorting through the pieces to copy the image onto the board. I hadn't realized that each animal piece had a small magnet hidden inside, which was just strong enough to help keep them on the board but not enough so that they would stick without being propped on one another. That way, Big Sister E had to learn that in order for the animals near the top to be included, the main train piece (which rested on the stationary pegs) had to be placed first. Watching her search and sort through the pieces, I was struck with how many different skills that the Animal Train Sort and Match focused on. As well as the color-matching, shape-matching and pattern-recognition, I felt like I could see her brain processing the problem-solving and cognitive thinking that was necessary... but all the while she was having fun. What a great combination in one compact, portable toy! Overall, we are adding the Sort and Match toys (there is also a Flower set and a Construction Truck set) to the list of high quality, entertaining and educational products that we know and love from Guidecraft. 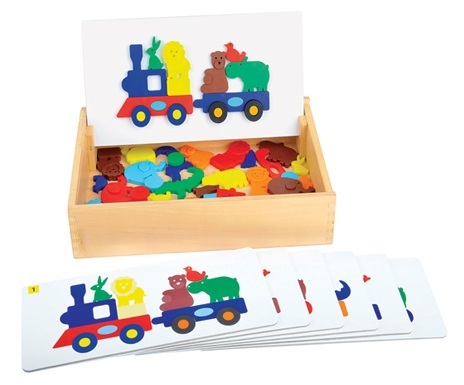 The wooden box is perfect for storing everything, the pattern cards are thick and durable and there isn't any chance of the magnets in the colorful animals coming loose. 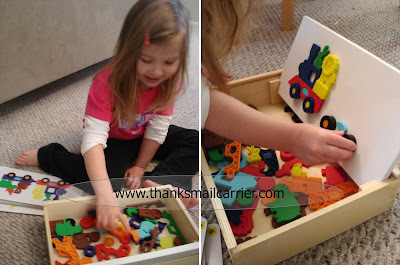 For a great combination of fun and learning, this toy is a hit! 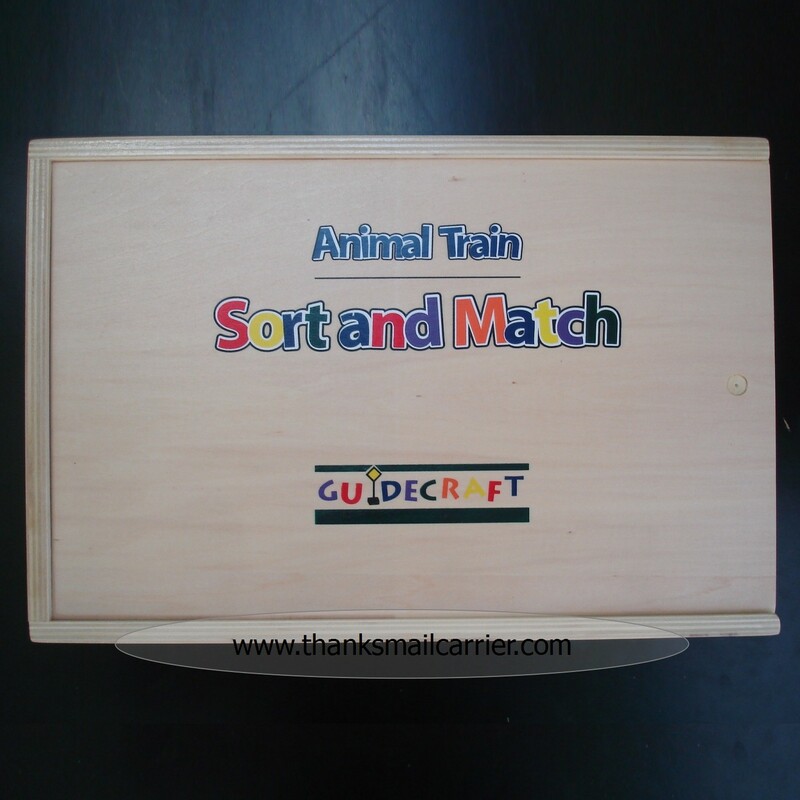 Now you can enter to win an Animal Train Match and Sort from Guidecraft! As this is a Guidecraft Moms review, that means one of the moms is hosting a giveaway, right? This month Life on a Taffy Pull is the lucky blog, so head over there and enter for a chance to win one of these great toys (ARV $40)! But hurry, this quick giveaway ends on midnight on Sunday, November 14th! Hi there! I am stopping on over from Hop Along Friday. I follow you via Facebook. Nice blog ya got here!